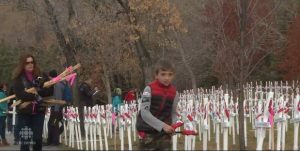 Thousands of fallen soldiers from southern Alberta are once again being honoured in the Field of Crosses in Calgary. Volunteers began work Saturday on the field, which sees the name of each southern Alberta soldier killed in action — dating back to the Boer War — written on a white cross erected along Memorial Drive near Centre Street. This is the ninth year for the memorial. Learning the name of each soldier killed is no easy task, said founder Murray McCann. Volunteers spent months visiting towns and cities across southern Alberta, checking cenotaphs, legions and even church records for names, which were then researched. “There was no central place to find out,” said McCann. More than 100 names were added this year, said McCann, bringing the current total to 3,410. The idea for the Field of Crosses came while McCann was travelling through Georgia in the U.S. about a decade ago. “I came across some crosses, which I thought was indicative of a bad accident, there was a whole row of them,” he said.